Rain, rain, seems like all it does these days is rain. The marigolds are turning brown, the geraniums look yellow. It’s enough to make you feel blue. But some things are thriving in all this precipitation. This is a banner year for slugs. Slug. Rhymes with ugh. No one likes slugs. Really, what good are they? They eat holes in lettuce and take bites out of tomatoes, and worst of all, they’re really, really slimy. I have to say, though, I have a sneaking fondness for slugs. I often lead kids on field trips and nature walks. And when it’s a gloomy, drizzly day, wildlife—at least the kind of wildlife kids like—is in short supply. No butterflies flitting, no hawks soaring, no caterpillars, even the frogs are hiding under water lilies, nothing but rain rain rain. But wait! 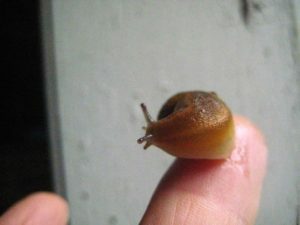 There’s a slug happily crawling along in the wet. Slugs have an unexpected friendliness, or maybe it’s just curiosity. If you’re bold enough to ignore the slime and pick one up, it starts checking you out almost right away. 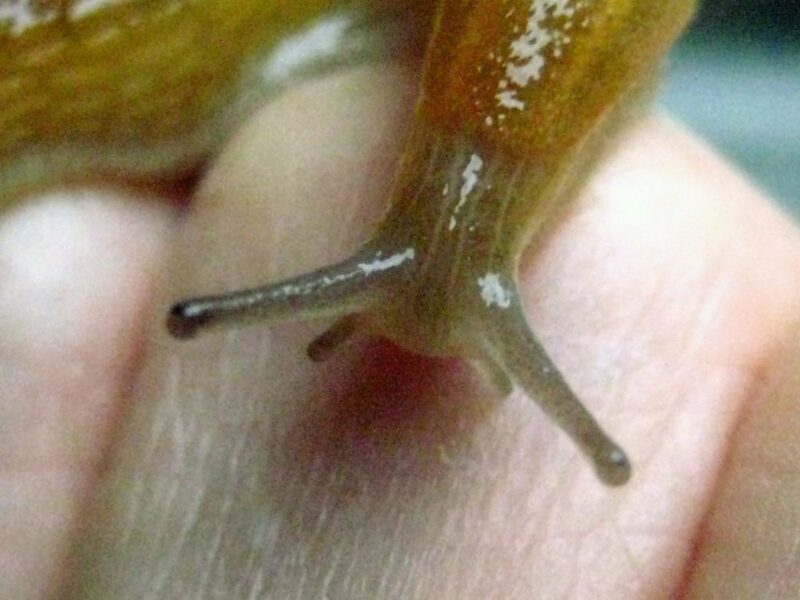 Probably feeling the warmth of your hand, the slug begins to inspect you. From the shapeless body poke little finger-like antennae. The top pair are sort of like eyes, light sensors, and the lower pair are like a sort of nose to detect odors. To the delight of kids, the slug can magically retract these antennae into its squishy body, and then promptly poke them out again, seeming to look you over with their long-stalked eyes. A slug’s personality can really blossom in front of an audience on a nature walk. Slugs get romantic in wet weather. They perform a sort of mating dance, circling each other round and round before clasping each other passionately. Slugs are hermaphroditic, having both male and female body parts, so after mating they both crawl off to lay eggs. Not all slugs are created equal. There are hundreds of species of slugs. There are carnivorous slugs, who stalk and prey on other slugs, tracking them by the slime trail they leave behind. Others are vegetarians, sadly, dining on our spinach and chard. They’re generally referred to as pests. 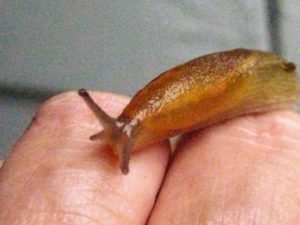 Google “slug” and hundreds of sites pop up with some pretty ferocious ways of getting rid of them. Seems like no one likes slugs. They’re not crowd-pleasers like, say, fireflies. But here’s the amazing thing—if it weren’t for slugs, there would be no fireflies. Firefly larva feed on slugs and snails as a main source of food. So even if you don’t fall in love with a slug when you look deep into its eyes, remember that the lowly slugs are what keeps the fireflies sparkling. If you want a summer night filled with fireflies, you have to welcome rainy days and slugs. Interesting! They might be some sort of parasite that’s adapted to deal with slug slime.